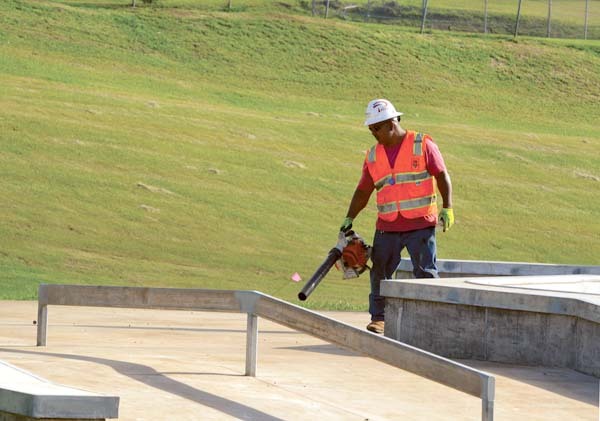 PUKALANI — The Pukalani community will get its gift of a skate park probably early next year, and it will come with what some may call extra wrapping — a fence. The Pukalani Community Association and Upcountry skate park supporters, though, don’t want a perimeter fence. 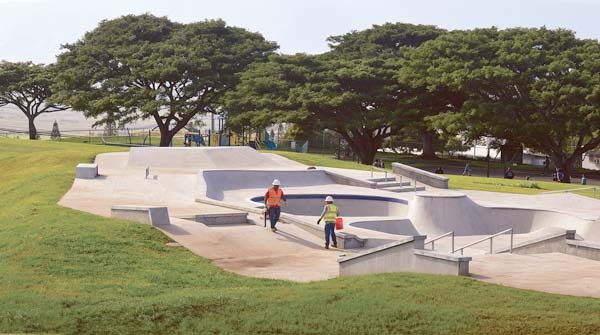 They want to preserve the views and foster more interaction between skateboarders and park-goers at Pukalani Park, where the 15,000 square-foot facility is built and awaiting the 6-foot tall chain-link fence. “Fences are kind of an eyesore,” she said. Goodfellow Bros. operator Tyler Prepose blows away debris from the concrete Pukalani skate park on Tuesday. They create barriers between riders and the community, he said. Chain-link fences, in particular, create issues because fingers can get caught in them, and they are the easiest fence to climb. Still, he didn’t think people were pro-fence on Maui, adding that there could be a duty and obligation to keep people safe and to protect the county from liability. “We certainly can’t fault them for that. The best thing we can do is to try to understand what the main purpose of the fence is, and if there are any possible alternatives” Statzell said. Security is one of the reasons the county is putting up the fence. A police officer told Clayton that fencing is needed because it is difficult to enforce hours or have someone leave the area if there are no signs and boundaries for the skate park. Parks and Recreation Department Director Ka’ala Buenconsejo said the fence is needed for the safety of park users, who could wander into the skate park and its deep bowls at night and fall. There is no lighting at the skate park, which will be open from 7 a.m. to 7 p.m.
During the park’s groundbreaking in March, Buenconsejo joked that the park would be a good Christmas gift to the community, but it appears the park opening will come a few weeks late, he said Tuesday. Contractor Goodfellow Bros. has until early January to complete the project, he added. Changing the type of fencing at this point would delay the official opening of the park, he said. The cost of the fencing came in at $38,000, which resulted in a $13,000 shortfall. The additional funding was approved by the Maui County Council last month. This was on top of the $1.5 million already alloted for construction. Kovacic and other community members have been watching the construction of the skate park and believed it was ready months ago, waiting only for the fence. Members of community even did a little fundraising and came up with nearly $200 to help with the fencing so the park could open sooner. On Tuesday afternoon, workers took off some temporary chaining and other material that blocked skaters from the park. Skaters nearby at the Upcountry Pool lower parking lot jumped on their skateboards and took to the park as construction workers were leaving Tuesday afternoon. Although the skate park does not have barricades, Buenconsejo said it is not officially open until the fencing is installed. 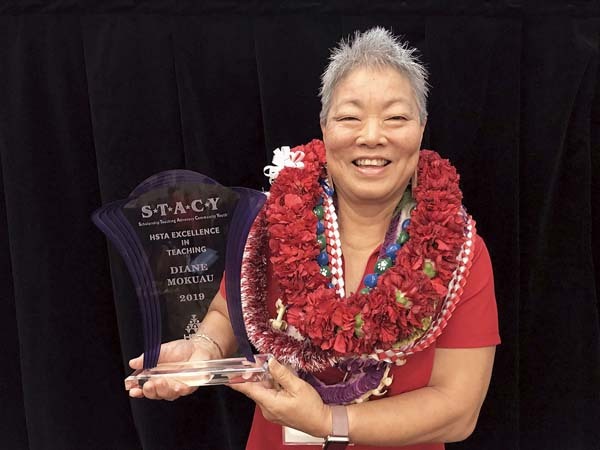 Council Member Yuki Lei Sugimura, whose residency seat includes Pukalani, said she hears the excitement of the community eager for the park opening but asked for patience for the safety of children and to prevent liability for the county. The skate park is multilevel and will accommodate beginners to advanced skateboarders. Features include half-pipe, quarter-pipe, rails, ramps, ledges and steps, county officials said. It will be similar to the Lahaina Skate Park. Upcountry skaters have said that they need to drive to other places on the island to skate legally. Many resort to doing their tricks along public roadways and in private areas instead. California Skateparks, a consultant on the project, has designed and built facilities for professional skaters, including Tony Hawk, and contests such as the X Games. Lahainaluna’s Ashley Akamine looks to shoot Tuesday. Baldwin’s Taylor Manangan drives up court as the Lunas’ Abby Akamine defends.